Adjustable king-size top and bottom belt drive to dependably seal uniform cases up to 25.5 inch wide by 36 inch high at up to 30 cases per minute. 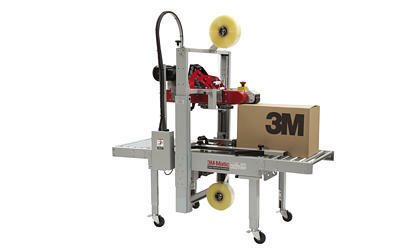 Includes 3M™ AccuGlide™ II Taping Heads for low-impact tape application. Uses up to 72 mm tape widths. •Case sealing, box sealer, taper, adjustable case sealer.